The Federal Reserve is arguably the nation’s most powerful economic actor. Its policy decisions have an enormous impact on each of our lives and on the course of our national economy. Those decisions play a key role in determining whether wages will rise for working families or whether they will stay flat; whether millions of unemployed and underemployed workers can find good jobs; and whether we will finally start to close the unjust wage gaps between the rich and the rest of us, between people of color and white Americans, between women and men. But, for far too long, our communities have been isolated from the Federal Reserve’s policy choices. Monetary policy has been left up to the bankers and the economists, with the public largely shut out and confounded by its seeming complexity. The consequences of this disengagement have been profound. For the past 45 years, with only a few exceptions, the Federal Reserve has set policy that benefits banks and harms borrowers, helps employers and hurts workers, and privileges the voices and needs of corporate elites rather than those of America’s working families. That’s finally beginning to change. Fed Up is the national campaign for a strong economy. All across the country, we are bringing the voices of regular people inside the marble walls of the Fed’s banks, calling on officials to build a strong economy where everybody who wants to work can find a good job. In the twelve Federal Reserve districts around the country, from Boston to San Francisco and Minneapolis to Atlanta, we are building coalitions of community leaders, workers, consumers, faith leaders, and elected officials who reject the notion that America must forever be afflicted by racial inequality and economic insecurity. Seven years after the Great Recession began, most of us continue to struggle. Wages are still lower than they were in 2000. Millions of workers have left the labor force, discouraged by the lack of good jobs. And there aren’t nearly enough full time jobs to go around, especially for African Americans and Hispanics: One in five Black workers and one in six Hispanic workers are unemployed or underemployed. The unemployment rate for Black workers is higher now than it was during the worst months of 2009 for white workers; Black America is still stuck in a Great Recession. While most families know that the economy is still weak, officials at the Federal Reserve appear to see things differently: they are getting ready to declare victory, and raise interest rates. Fed officials have said that in the fall or winter of 2015, they are going to intentionally slow down economic growth, so that the economy will produce fewer jobs and lower wages for workers. By raising interest rates, the Federal Reserve will make it more expensive for us to pay our credit card, student loan, car, and mortgage payments. That means we will have less money in our pockets to buy the goods andservices we need. And that will have a terrible ripple effect throughout the economy: businesses will earn less revenue, so they will lay off workers (or avoid hiring new workers) and they won’t be able or willing to give workers any raises. With bad job prospects and stagnant wages, working families won’t earn enough to buy the goods and services they need, which starts the whole cycle again. If this sounds like a terrible idea, that’s because it is. But, unfortunately, it is exactly the goal that Federal Reserve officials are trying to achieve when they raise interest rates: they are trying to slow down the economy so that there are fewer new jobs and workers have less power to negotiate raises. Fed officials are going to raise interest rates because they believe that workers’ wages are now rising too quickly. Why would Federal Reserve officials do that? Why would they think that the economy has returned to health and should be slowed down? One reason is that Federal Reserve officials spend most of their time talking to wealthy bankers, corporate executives, and other people who are doing very well in this economy. From their perspective, the economy is healthy: unemployment is almost nonexistent and high incomes are getting even higher. This skewed reality is a result of the fact that the Federal Reserve’s governance is dominated by corporate and financial executives. Although it is a government agency—and our nation’s central bank —two-thirds of the leadership of the Federal Reserve’s twelve regional banks is selected by private sector commercial banks. That’s right: big Wall Street banks get to pick one layer of leadership for the Federal Reserve (the “Directors”) and those people go on to select the regional “Presidents” who set monetary policy for the entire country. It is no wonder that, for too long, the Federal Reserve has prioritized the needs of banks and the richest members of society. Fed officials almost never hear from working families who are struggling to build a decent life for their children, working hard every day and never feeling like we’re getting ahead. Federal Reserve officials can change their perspective and change their methods of governance. They can open their ears to the perspectives and opinions of people who are struggling, not just people who are thriving. They can open their eyes to the dreams of parents across the country who want to build a secure and dignified life for their children. They can commit themselves to an economy where prosperity is shared, where community investment is valued over corporate profits. They can recognize that Black lives and livelihoods matter. And they can acknowledge that the labor market is nowhere near healthy. 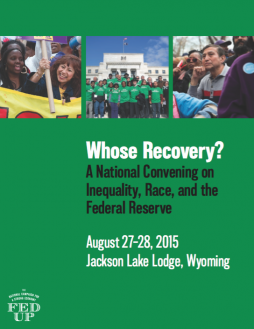 Since the 1980s, the top Federal Reserve officials have gathered in the remote national park of Jackson Hole, Wyoming for their annual policy conference. Bankers, economists, and other members of the financial elite pay $1000 each to talk about what policies the Fed should adopt in the coming year. This year, as if to highlight the disconnect between their perspective and the actual challenges faced by the American economy, the topic of the Fed’s symposium is “Inflation Dynamics and Monetary Policy.” Of course, inflation has not been a problem in America for 35 years. Instead, we are suffering from stagnant wages and widening inequality. Fed Up has come to Jackson Hole to offer a different perspective. We’ve come here to identify the real challenges facing our country, lay out a vision for a more just and equitable society, and tell Federal Reserve officials that we expect them to represent the public interest and build an economy that works for all of us.